We believe and profess all the truths of the Catholic Church. We believe that every child will fall in love with the Catholic Faith if they are taught with love. We believe that Catholic Parents need support and love to become the incredible teachers their kids need. We believe that we have a duty to pass on our faith and we are happy to embrace this mission! When you become part of the Catholic Sprouts Community you will receive INSTANT access to a whole library of materials designed to help you teach the Catholic Faith in a fun, meaningful way. Catholic Sprouts for Moms is a Youtube channel dedicated to serving and support Catholic Parents in the work of RAISING SAINTS. Subscribe for weekly videos that will instruct, challenge and inspire you in your faith! You CAN have a prayer life, and hobbies and a loving marriage while raising little saints. Through God's goodness, I have been able to help thousands of Catholic Families deep in the work of Raising Saints, all while working hard to raise my own (soon to be) 5 little saints. As a busy mother of little ones I get just how hard this vocation is--but I also know how important it is. The most precious gift we can give our children is the gift of our CATHOLIC FAITH. Let me walk this journey with you! Use the daily podcast, Catholic Sprouts, as an easy source of daily Catechism. 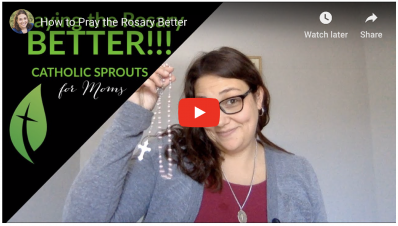 Use the weekly videos on Catholic Sprouts for Moms as a source of inspiration and fuel to dig deeper into your own faith and guide your children in theirs. It is my profound joy and honor to humbly serve you in this small way. And, I would love to connect with you personally! Subscribe and hit reply to the first email you get from me (I read ALL of my email!) so that I can get to know you and the little saints you are active raising!